Once we are writing a class the access modifier describes the properties of that class . 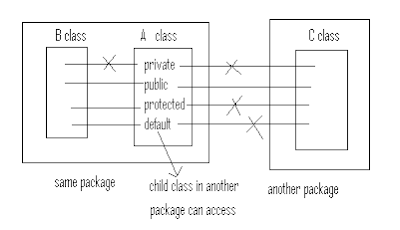 (creation of child class is allowed or not ,creation of object is allowed or not ,we can access this class from outside the package or not and so on). Access specifiers or Access modifiers are same in case of java.java compiler shows the error related to public,static,.......so on , it use the word modifier not Specifier. If we are using other then these modifiers ,compile time error saying modifier some not allowed here. A public class can be accessed from any where with in the package /outside the package. If a class declared as the default ,we are allowed to access that class only with in the current package.If you are trying to access from outside package compilation fails. Here class B is is default ,but not public in pack1.So this class can’t be accessed from outside package. If a class declared as the final then we are not allowed to create the child class. We can implement security . Limitation:As we are not allowed to create the child class,we are missing the key benefits of object oriented programming ,re usability and flexibility.Its not a good programming practice to use final classes in the real time unless security is required. If a method declared as the final ,it indicates that this implementation is final implementation. i.e we are not allowed to override this implementation the child class. If a class declared as the abstract ,we should create the child class to provide implementation for abstract methods. If a class declared as the final ,you are not allowed to create the child class.Hence final and abstract combination is illegal for classes. void m1(); //error: missing method body or declaration missing. Abstract methods should be overridden in the child class to provide implementation.But final methods are not allowed to override .Hence abstract and final combination is illegal for methods also. A final class never allowed to contain abstract methods .but a final methods is allowed to keep inside abstract class.i,e final method in abstract class is valid But abstract method in final class is not valid. Abstract is the keyword which can be applied for classes and methods only.i.e we can’t use abstract keyword for a variable. final is the keyword which can be applied for classes ,methods and variables. This keyword we can apply for classes and methods .i.e we can’t apply strictfp for the variables. If a method declared as the strictfp all the floating point calculations inside that method has to follow “IEEE 754” standards so that we will get platform independent result. If a class declared as the strictfp ,all concrete methods in that class has to follow IEE 754 standard for floating point calculations . Abstract and strictfp combination is not-valid for methods .But it is valid combination for the classes. If a member is declared as public ,we are allowed to access that member from any where with in the package or outside the package. The corresponding class must be visible.Before checking member visibility ,first we have to check class visibility. If class A is declared as public ,then the class B compiles fine and prints “Hai”. If a member declared as the default ,that member is visible with in the current package only. error:m1() is not public in pack1.A. Hence default modifier is also known as package level modifier. If a member declared as the private we can access with in that class only.i.e from outside the class,you are not allowed to access. It is highly recommended to declare data members as private to achieve security. protected member:The most misunderstood modifier in java .If a member declared as the protected with in the current package,every where we are allowed to access,but outside the package ,we can access only in the child classes. The protected members can be accessed with in the current package any where either by using parent class reference or by using child class reference. But from outside package we can access protected member only by using child class reference . If we are using parent class reference to access protected member from outside package we will get a compile time error. error :finalize has protected access. final is the keyword which can be applied for methods classes and variables. Instance and static variables will get default values always .There is no need to perform explicit initialization. But the local variables never get any default values .Before accessing a local variable ,we should perform initialization other wise compile time error. For the final instance variables ,we should perform initialization other wise compile time error. The final instance variable must be initialization before constructor compiles.i.e at the time of declaration or inside instance initialization block or inside constructor. Final static variables must be initialized before class loaded into memory. otherwise compile time error. i.e we can perform initialization for the final static variables at one of the following places. Local variables even though we can declared as the final must be initialized before using. For the local variables the only allowed modifier is final. The variables which are declared as the method arguments are simply acts as local variables of that method .hence the only applicable modifier for the logical variables is final. If any formal parameter declared as the final we are not allowed change its value with in the method. We can not apply static keyword for the top level classes,but we can apply inner classes. For every object a separate copy of instance variables will be created but in the case of static variables a single copy will be created at the class level and shared by all the objects of that class. Most of the cases the keyword static associated with final modifier for defining class level constants. 3)Usually static methods are utility methods and we should provide complete implementation but for abstract methods we are not allowed to provide implementation . Hence abstrace and static combination is illegal for the methods. Synchronized is the keyword which can be apply for method and blocks. i.e we can not apply synchronized keyword for classes and variables. If a method declared as synchronized at a time only one thread is allowed to execute that method on the given object. 1)synchronized keyword increases waiting time of threads and hence performance of the system goes down.hence unless and until there is no specific requirement do not use synchronized keyword in the coding. Note:Synchronized is the keyword which is always talks about implementation but abstract never talks about implementation.Hence synchronized and abstract combination is illegal for the methods. Native is the keyword which can be apply only for methods. i.e we can not apply native keyword for classes and variables. 2) Native methods are also known as foreign methods. Native and strictfp combination is illegal for methods because old languages may not fallow IEEE 754 standerd for floating point. Transient is the keyword which can be applicable only for variables i.e., we are not allowed to use transient keyword for methods and classes. The process of saving an object to a file is called serialization Strictly serialization means “The process of converting java supported format object to network supported format object (or) file supported format object is called serialization. 1)If a variable declared as a transient, at the time of serialization JVM ignores the values of that the transient variable. Instead of original values JVM saves default value. 2) Hence transient means not to serialize. Note:- static variables never part of object state hence we are not participating in the serialization process during a static variables as the transient is useless and there is no impact. Volatile is the keyword which can be applicable only for variables i.e we can not use for classes and methods . If the value of the variable is changing frequently such tpe of variables we have to declare with the keyword volatile. 4) Volatile means the value keep on changing but final means the value is not allowed to change. Hence volatile and final combination is always illegal. We are not declaring a final variable as volatile.